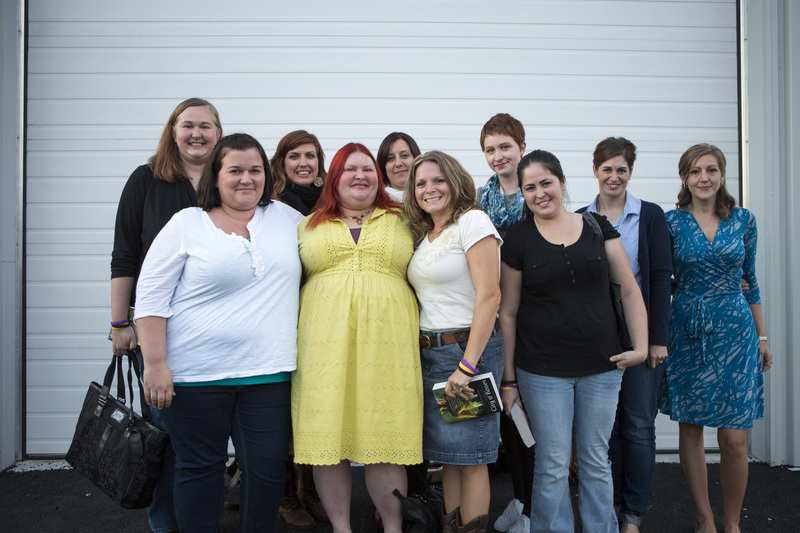 For Cassandra Clare, seeing her world come to life has been both surreal and a little nerve wracking. As an author there are things that you cannot control when your book is made into a film — other than who options it — but Cassie has been lucky enough to be involved in many important aspects of the adaptation process, including consulting and casting. The studio has been adamant about making her as involved as possible in the film. She even has a cameo. When a book makes the transition to the big screen it’s important to remember that it is merely an interpretation of the original text, which is something Cassie stressed. She said that Harald Zwart’s interpretation will add a “layer of meaning” to the story. It’s simply another telling of her world. Visiting the Toronto set of The Mortal Instruments: City of Bones last September, we were lucky to have Cassie accompany us on our trip. Even prior to our set visit Cassie had dinner with the fan sites where we all talked and she answered our questions. We don’t need to tell you how sweet and kind she is. Which is incredibly sweet and kind. It’s something that people can gauge even through her interaction with her fans through social media. Having Cassie on the set visit with us was incredible. She toured the set with us — taking it all in, answering our questions and explaining the small details. It was fascinating to watch her in what was surely such a surreal experience for her — interacting with aspects of her world that had come to life, with us at her side. At that moment she was as much a fan as we were. I think the first time that I saw the City of Bones, I thought wow this is exactly how I pictured it. It’s…I don’t want to say too much about it, but it’s really amazing and incredibly detailed. Every little tiny piece of the set is different and it really felt like a real place to me. The story of City of Bones/Mortal Instruments was inspired by a trip you took to a tattoo shop. Do you have any tattoos, and are any inspired by your novels? I do not have any tattoos, I have never been able to commit to a particular tattoo, unfortunately, but I would love to get a tattoo and I’ve been thinking that maybe when the movie comes out I’ll get one of the Runes. What inspired your awesome pen name? It’s the name of Jane Austen’s sister and she used to write stories for her sister so that was the inspiration. For your readers, what do you think the film is going to add to this/your story they already know and love so well? Well I think that a film always adds another layer of meaning to a story the same way than a play adaptation or a piece of music inspired by a story adds another layer of meaning. A film is an interpretation of a book and so I think that it will provide people with an opportunity to see another interpretation to the book. What scenes are you most excited to see? I think that for me it would really be a tossup in terms of the scene that I’m most excited to see between Magnus’ Party and the Greenhouse scene with Clary and Jace that we all know and love. Is there a piece of advice you’ve given to a specific actor, in regard to their character, that surprised them? I’m not sure that I’ve really given a piece of advice that really surprised them but I’ve certainly talked to them about giving themselves the freedom to interpret their characters the way that they see them and not to worry about trying to hue to any of the particular other interpretations that you can find. You know, every different fan has their own interpretation of what those characters are like and I really wanted the actors to feel like they should interpret the characters the way they saw them. What makes Harald Zwart the right director for this film? I think Harald is the right director for this film because he is actually not a fantasy guy in the sense that he hasn’t done fantasy movies before. It doesn’t mean he doesn’t like fantasy, he is a fan, but he comes at the project from the point of view of someone who has always concentrated on the emotional relationships between characters in his work and so, in these stories he does the same, he concentrates on the emotional work between the characters, their different relationships, he’s very committed to underlining that every character has a relationship with every other character and I think it’s that kind of basis that’s required to make a fantasy feel real. Is it difficult releasing control of your story to a screenplay writer and letting someone else translate your words to the big screen? Well I am a bit of a control freak so it is difficult to let go of a story and let someone else takeover their, you know with their interpretation of it, but, working with Constantin has been really great. They’ve certainly talked to me a lot, taken my opinion into account, and thought about the things that I have said. And at the end of the day, I am also excited, just as my readers are, to see the final product and ready to be surprised. When Lily was first cast as Clary, what advice did you give her for portraying the role? When Lily was first cast as Clary, I was actually surprised, I didn’t realize they were going to cast her and so I think that I gave her the advice not to feel pressured by the idea that there were a lot of people who had investment in the character and who wanted to see the character portrayed this way or another way, not to get too hung up on people on wanting to make sure she had the right red color of hair or the right green color of eyes, but to try to capture what she felt was the intrinsic spirit of the character and I really believed in her ability to do that and from what I have seen, she has. Stay tuned tomorrow at 3 PM ET/12 PM PT for our next Set interview from the set of The Mortal Instruments: City of Bones. LOVED IT! The part where she talks about the film adding another layer of meaning to the book is SO spot on. I feel that way about movies & music for book to film adaptations. Great interview, guys! Can’t want for the next one. what does it mean another layer? Will/Jem- Does this help: I would say that it means adding other nuances to what you have interpreted from reading. A film, by providing visual references and sound and portrayal gives the opportunity for POVs besides the author’s written word and your own interpretation of the words. I love this, because I think people are so uptight about the movie being exactly how they pictured it. I mean, don’t get me wrong, I want it to be close. But I think that the way directors change things are really creative, and I know this movie will be fantastic!! so true, i think all of us fans should feel really lucky and thankfull that these books we LOVE so much are even getting turned in to films and getting to see what we picture when we read come alive on big screen:D and not to mention getting a SPOT ON CAST!!! an amazing interview! loved it!